On January 14, I posted a photo of the Mississippi River where it is very wide and the water flows fast. Today I'm posting from the same location, yet it's the channel of water south of Raspberry Island. Less water flow, the distance from shore to shore is less, thus giving the appearance of solid ice. Trust me, it's not something you'd ever want to walk on. There is still water flowing under the layer of thin ice. What I like about the photo is, since the layer of ice developed, it has not snowed on top. This leaves the surface nice and reflective for the sun and giving a neat effect for this photo. It does look neat, you sure cant tell theres water moving under the ice. You have received the Make My Day Bloggers Award! Check it out at my blog, Guelph Daily Photo. 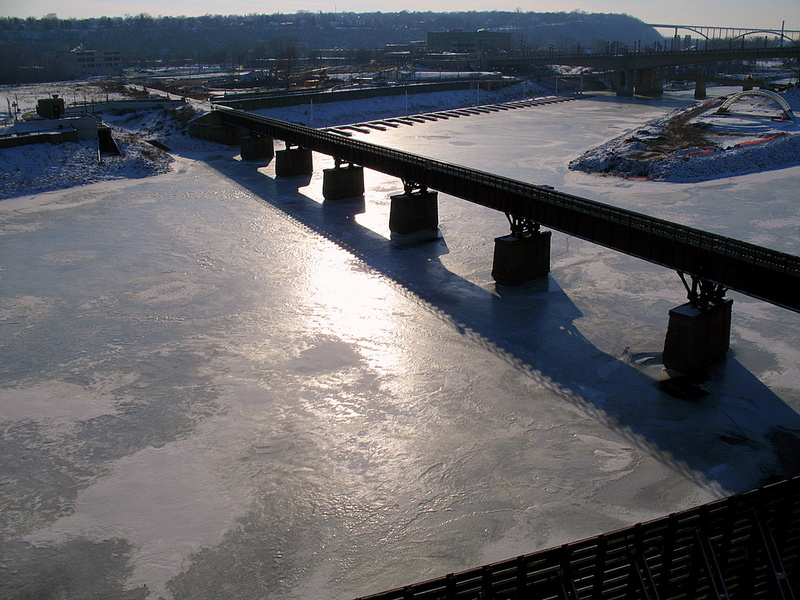 It is not often we get to see the Mississippi River iced over.